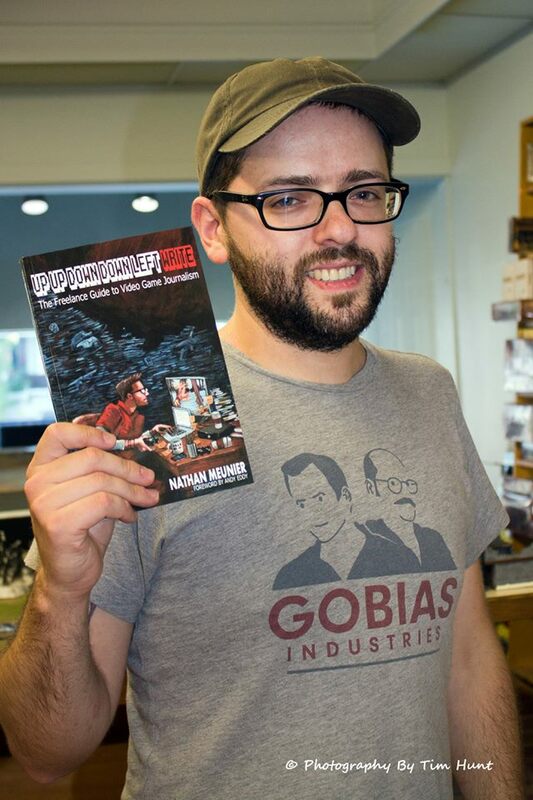 I gathered last night with a group of friends at our local gaming store to sign copies of my new book Up Up Down Down Left WRITE: The Freelance Guide to Video Game Journalism. 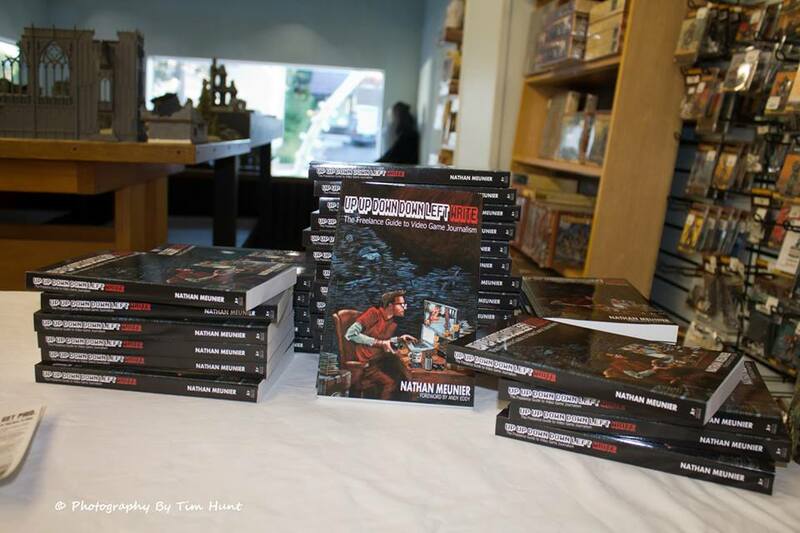 It was really cool to be setup right in the middle of a massive pile of nerdy awesomeness. Warhammer figurines to my left, used games to my right, a huge rack of AD&D manual across the room, and a GIANT Magic The Gathering tournament going on at the other side of the shop. I spent a little time talking about how I got started, what it’s like being a professional nerd, and all of that good stuff. Fun night! 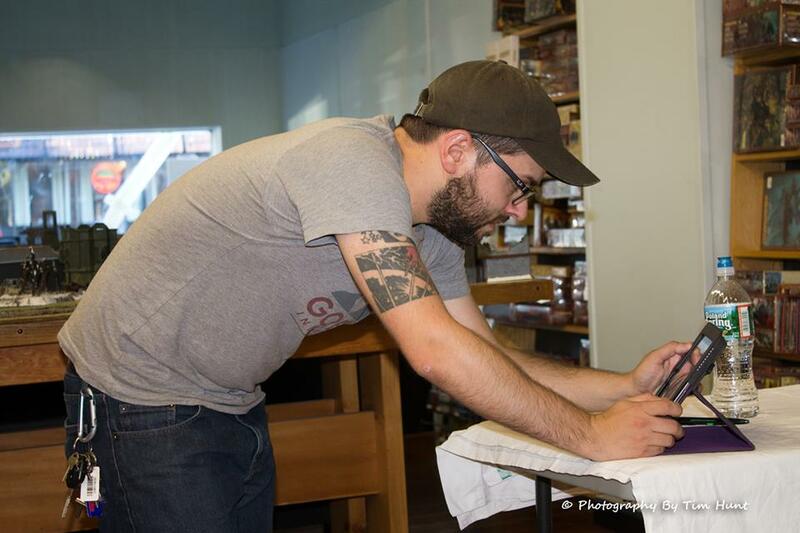 My pal and excellent local photographer Tim Hunt snapped a few pics while I was noodling around before the discussion. Figured I’d share them! The book is available in print and on Kindle now! Check it out! Up Up Down Down Left WRITE in the nerdy wilds! Note the giant gaming tables in the background for Warhammer battles. Also, Warhammer figurines as far as the eye can see. I love giant robots. The end. I don’t even know what I’m doing here. Checking e-mail? Wondering where the hell everybody is? Thankfully, a good-sized group of pals came out shortly after to hear me jibber-jabber. This entry was posted in Up Up Down Down Left WRITE and tagged beardbros, book, book signing, freelance, nathan meunier, up up down down left write by nmeunier. Bookmark the permalink.